Morty, the boss of me for a few years in the 1990s at the now defunct 8th Street Wine and Liquor, used to yell at me to laugh. He thought I was too serious and morose, a walking cadaver. Morty was in his seventies. He’d undergone enemy fire on a warship in the Pacific, had buried both his parents, and was on his second marriage and his second liquor store after his first store had burned to the ground. I was in my early twenties. I was untouched. He’d told me that one before, too, but I didn’t say anything. I just sat there trying to picture what it would look like, me being good to myself, but all I could see was myself tucking myself in for a nice long afternoon nap, which I did whenever possible anyway, always waking in the dusk with a stomach-wrenching sense that the end was near. Scared and doomed, I’d stagger to the bathroom and look at my face and hate it. Someone else was going to have to be good to me. When Burt Hooton was the age I was as I slumped behind the liquor store counter, he had already gotten his career off to an almost impossibly good start. He had swept into the big leagues as a first round draft pick of the Chicago Cubs after posting a 35-3 record at the University of Texas. Then, in his fourth major league game, he had pitched a no-hitter. After that, the guttering Cubs began to drag him down to their level somewhat, and by the early 1975 his won-loss record, rightly or wrongly the primary yardstick for pitcher evaluation back in those days, stood at 34-44. He was traded to the Dodgers in May of 1975 and everything changed. He was on a contender. He was winning. At some point in the midst of all this he was asked by a Topps photographer to pose for a picture to be used on the 1976 baseball card at the top of this page. I really didn’t think I was such a sad sack. So I didn’t roll with laughter every two seconds, so what? I’m deep, I thought. My joys are visionary, my sorrows timeless, etc. I considered myself this sensitive soul, a modern-day Rilke, if instead of swooning around the castles of his various benefactors writing immortal poetry Rilke had been employed to sell half-pints of Leeds Vodka to men struggling to inch through the day. When I think of those early days at the store I think of the greasy nickels those men pulled from their pockets and shoved across the counter to me. I think of a lot of things. I think of a maroon Corvoisier windbreaker, a promotional item a salesman had dropped off years before. My brother, who had preceded me as a clerk at the store, had first inherited the jacket, and then it had been handed down to me. The right pocket had started to rip and the flap hung down. Really, if you thought about it, I needed a new jacket. But I never thought about it. 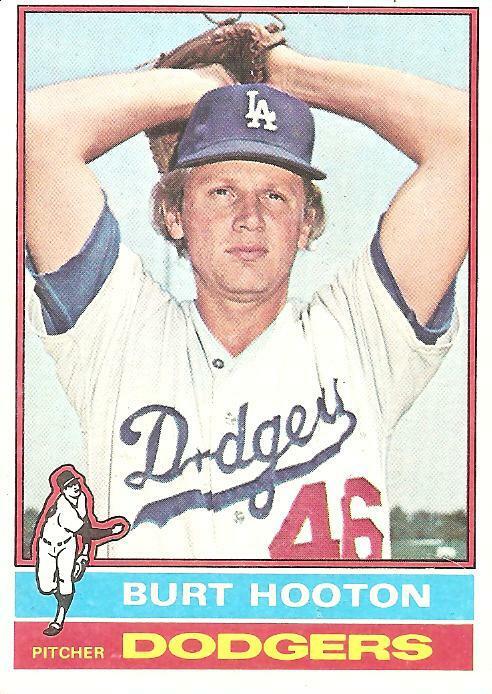 With the Dodgers, Burt Hooton became a top pitcher on an elite team. He finished second in the Cy Young race in 1978 and made an All-Star team in 1981. I don’t know exactly when or where this photo was taken, but some of the improving fortunes of Burt Hooton, nicknamed “Happy” by manager Tommy Lasorda, must have begun to announce themselves by the time the photographer asked the pitcher to pose for his baseball card picture. Look around you, Burt Hooton. All-Stars everywhere. Starlets in the stands. Wins piling up on your record. Sun shining down. And your young heart is thumping, is it not, Burt Hooton? So give us a smile, Happy Hooton. Say cheese. But it’s always been this way. When the excitement of ripping open the wax wrapper is gone, and the gum has become a tasteless pellet, the blankness of the day begins to loom. You look to the gods, and some of them smile, even beam, and some are in the middle of the action that you are not a part of, but as often as not they stare back, unsmiling. They have been traded. They have lost. They will someday be released. Even if they’re in the midst of a warm blue day, they understand everything is fleeting, everything will be released. I’d concentrated on writing poetry during college, but in the liquor store days I was losing my grip on it. Every poem I tried flattened into monotonous sentences searching for a story in a life that proceeded as if designed to avoid any kind of a narrative thrust whatsoever. “You just need to get laid,” said another boss of me one evening. This was Dave, the store’s night manager, who worked a few nights a week after logging some classroom hours as an adjunct philosophy professor. He gave me pep talks about women. He kept telling me they were as lonely as guys. I didn’t believe it. “You just have to talk to them,” he said. But I didn’t feel like I had it in me to do that. So I just stared at them whenever the opportunity presented itself, hoping that they’d see my Rilkean sensitivities and take things from there. I needed something like that, some kind of rescue. “You just need some more confidence,” Dave told me more than once. I didn’t disagree with him, but I saw that any kind of an improvement would have to come from outside myself. I was at the mercy of life. I was waiting to be told I’d been traded to a winning situation. You are currently browsing the archives for the Burt Hooton category.